This is our top-of-the line court. It is a 6’ x 40’ court with 2 shooting sections of 6’ x 6’ and a 2 ft. walkway on both sides. The perimeter has a white stripe that keeps the disks in the plastic area. This is the best looking court of all. The disks never leave the plastic area (you don’t have to go chasing after your disks). The disks stay new because they don’t get scratched underneath like they would on a concrete court. Requires a 10' x 52' level area. 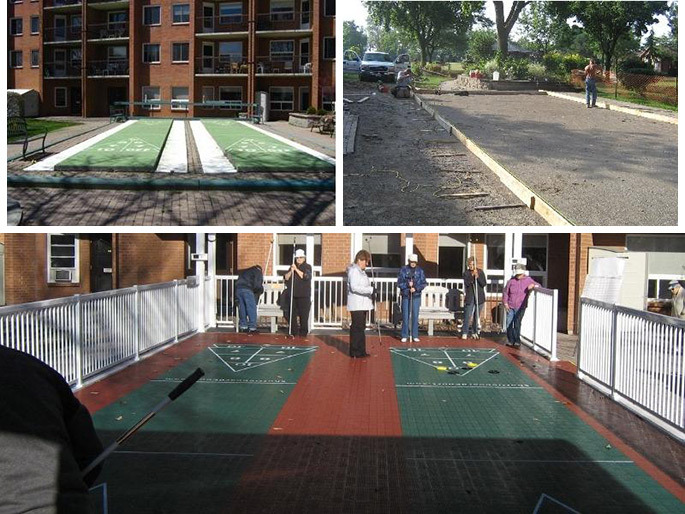 Shuffleboard court #1 has 240 green tiles for the court itself. Court #1 has 280 red tiles for the surrounding area. Court #1 has 124 linear feet of white stripe around the perimeter to stop disks.